As you know we had to buy a vehicle under duress, but God was good bringing us to the vehicle He had prepared for us. I appreciated that very much, but in truth I was still resentful about having to go into debt for a vehicle, so that my husband would not be fired, even though it is likely that his old van might not have made it for another year as we had been hoping. As you also know our dishwasher decided to quit on us and we could have replaced the control panel for the second time (we replaced the grinder once also with a much louder one), but it if they only were lasting about four years with each replacement on this model, it just seemed to be more cost effective to buy a new one with better reviews and an extended warranty. What you do not know is that as we came to the second appliance store looking for our dishwasher, I realized that I had lost the key to the new vehicle and only that key. It was not on my main key ring, but on the hook with it. Of course, it is not the average key either—oh, no! It has the remote to open the doors is in the key itself. So, we spent time retracing all our steps, but we did not find it. As I thought about it, I could have lost it anytime from the previous Sunday, the only I drove the new vehicle was to pick up the Princess from play practice, and I just now noticed it that Saturday. For the following days I called every place I had been in the past week. One actually had a remote Ford all by itself, but it was not our key, because the teeth of the key was on the outer edge and ours is a laser cut, so the outside of the key is straight and the teeth are in the middle. 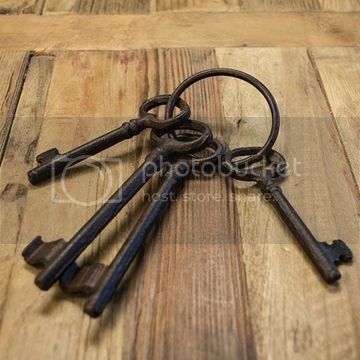 Keys used to be so simple, but technology complicates everything. Between the laser cut and the programming of the remote, this is a $300 key. Not kidding! Then I found myself thinking of Jonah sitting with a good view to watch the destruction of Nineveh still seething with resentment for having to do something he most definitely had not wanted to do. God even provided him some comfort in the shade and then He took it away. I really should have been more grateful for the new vehicle and more careful with its special, high-priced key, which is now on my main key ring in a highly respected place and a key reminder of how to properly be grateful...and every day I am very grateful it is there! Thank you, my Lord, for reminding me that a key aspect of being truly grateful is to not have any resentment.